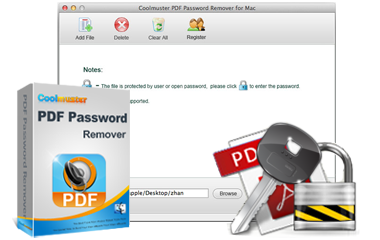 Coolmuster PDF Password Remover for Mac is a small yet powerful PDF decryption tool on Mac OS X. It enables Mac users to remove copying and printing restrictions from encrypted PDF files easily and quickly. Remove owner or user password from encrypted PDF documents effortlessly. Support batch decrypting PDF files at one time. No need the assistance from any additional software, such as Adobe Reader or Acrobat. Remove owner password for printing, copying and editing PDF files without entering any password. Decrypt user password from PDF files with entering the authorized password. Can you imagine that cracking PDF password on Mac in a batch? 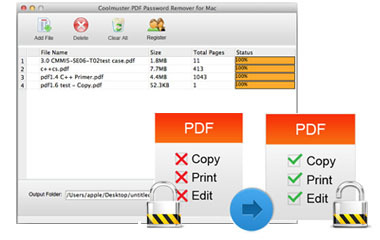 Yeah, Coolmuster enables you to remove password protections from unlimited PDF files on Mac as you like. 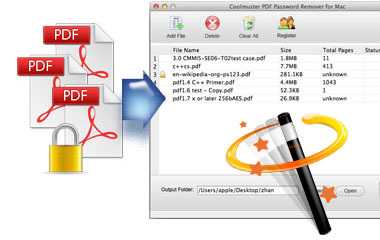 Remove PDF password and restrictions for multiple encrypted PDF files at one time. This is a good way for improving working efficiency. Drag and drop operation allows you to import a large amount of PDF files into the program for decrypting. A user password is to control the permission of opening a PDF. If a PDF is protected by a user password, you can enter the correct user password and save the PDF to a new PDF file without user password. After saving a new PDF file, you can share the PDF with anyone you want more easily. Afraid of losing data while you're using these desktop application? Take it easy, just rest assured to download and install our tool on your Mac. We promise that there is no spyware, no adware and no viruses in our installation file. There are only 4 major operating buttons clearly displayed on the main window and no complicated options make you confused. It is really easy to use for both beginners and experts. After importing, detailed info like file name, size and total pages will show to you. Process all files simultaneously or right click to decrypt specified one. All versions of Adobe Acrobat and any PDF viewer or readers are supported to open or view the decrypted Adobe PDF documents without any restrictions. 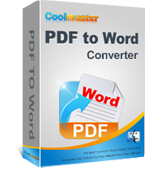 Converting PDF to Microsoft Word could be a simple task once you have this PDF to Word Converter for Mac software. Now, just get it to try its amazing functions.